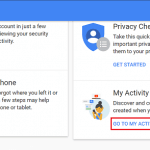 You are here: Home / Delete Email Accounts / How to Delete Yahoo Account? Did get bored using Yahoo? You feel like using Yahoo account is so obsolete? 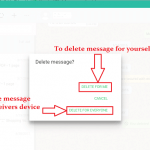 Or you want to delete your Yahoo account and open a new one with a fresh start? Or you have multiple Yahoo account, and you feel like it is too time-consuming to maintain all of them. What so ever be the reason if you want to delete Yahoo account we are here providing clear steps on how to delete Yahoo account permanently. But before getting started to keep in mind that once you delete your Yahoo Mail account, it can never be recovered. You will lose all the contacts, emails, messages and attachments so if you think you might need any of them in future you’d better back them up. If you remove your Yahoo account, you will not be able to use various services (like Flicks, Tumblr and so on) that Yahoo provides so delete your account only when you are confident that you want to remove it. 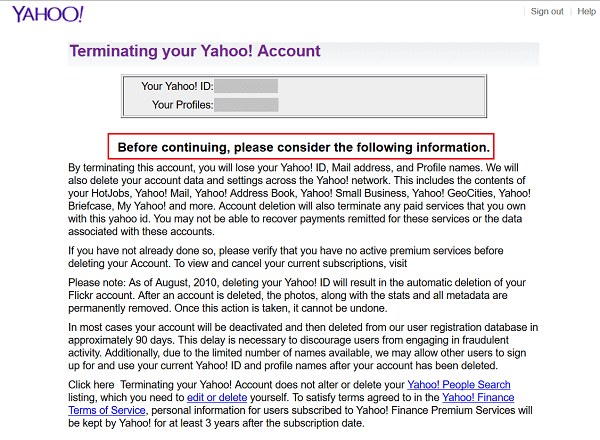 How to Delete My Yahoo Account Permanently? Users find it difficult to find Yahoo Mail account delete page link on Yahoo account page. It is hidden in several sub-pages. Login into Yahoo account > Account info > Help > My Account > Delete Account section > Close your Yahoo Account > Account termination. It’s a lengthy and confusing process in itself. So we’ve sorted out and provided the direct link to Delete my Yahoo account permanently page. 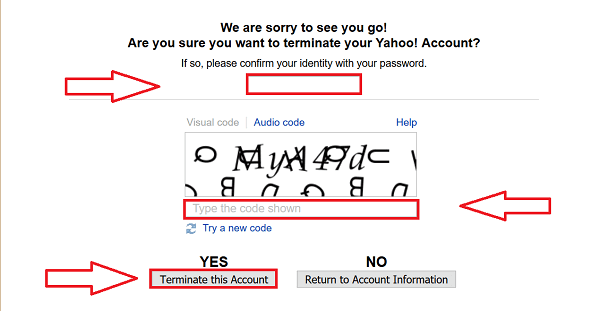 Thoroughly follow the steps below to complete terminating Yahoo account. Open any web browser and visit Close my Yahoo account page. 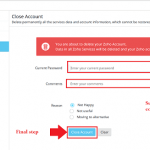 Login Yahoo Mail using username and password of the account you want to delete. You’ve to sign into Yahoo mail even you’ve logged into Yahoo already. After you log in, a Yahoo account terminating page will appear. 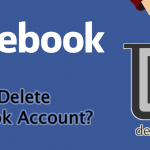 Account termination page contains all the matters that are to be considered before closing Yahoo account and the consequences of deleting the account. Confirm your identity with Yahoo password once again. 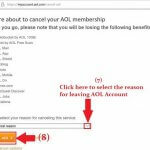 Then click on “Terminate this Account” as shown below. Enter the Yahoo Mail login password and Captcha code displayed on the screen. Switch to the visual and audio system if you’re having trouble to get it. Captcha codes are not case sensitive. If you want to return to Yahoo account, select ‘Return to Account Information’ under ‘NO’ box. Your Yahoo account is now deleted. You will never be able to access the Yahoo account anymore. However, you will always be able to open a new Yahoo account and have access to all the facilities provided by Yahoo! as before. Even if you have deleted, your Yahoo account people will be able to send you emails and messages without delivery error message up to 90 days of the closure of your account. So make sure that you inform your close group who will probably send you email or message in Yahoo Account. You will be able to use all the credentials of the closed account to open the new account only after 90 days of closure of your Yahoo account. site on a regular basis, if so then you will definitely take nice know-how.